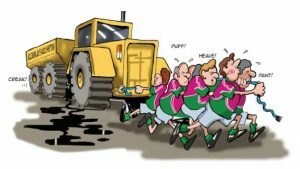 In an effort to repay their long-outstanding debt of almost €1,000, the fictional Ballybore GAA Club’s members decide unanimously, to pull John Joe McLoughlin’s Volvo Dump Truck – the new one – around the town and try to get into the Guinness Book of Records in the process. Club Chairman and local Councillor Patrick F, (his Father was a TD and his grandfather a Government Minister,) devises a plan to circumnavigate the difficulties that the layout of Ballybore poses. Things rarely go smoothly when Patrick F is in charge and this task too proves challenging. He is aided by his best-friend and arch-enemy, Máirtín (the best player never to play for the county,) and Brendan Gerard who is in exile from his family. (Brendan Gerard hasn’t touched a drop now for seven years, two months, three weeks and two days.) Patrick F’s twin brother Pius gets caught-up in the events as they start to unravel, with disastrous consequences for him; less so for Patrick F. It isn’t a great week for Brendan Gerard either. “The Pull” was written by John Corless and Liam Horan. It is an interactive comedy of two halves; the first lasting about an hour and the second around sixty minutes and is suitable for all the family – even neighbours. ‘A great night’s entertainment, a great laugh. Anyone who is in to GAA will really enjoy it.’ – Martina Grehan, Ferbane-Belmont Minor GAA, Co. Offaly. ‘On behalf of Shannon Gaels, Co. Roscommon, I would like to congratulate HalfSolid Productions on their staging of “The Pull” in Carrick-on-Shannon. It was a thoroughly enjoyable night and was carried out in a very professional, but also friendly, manner by all concerned. It turned out to be a very good fundraiser and the large crowd enjoyed the sharp, witty humour, especially the moments of audience participation. Thank you for a great night.’ – Sean Murtagh, Shannon Gaels GAA Club, Co. Roscommon. ‘Through the chair, we would highly recommend The Pull. The talent and energy of the guys in HalfSolid Productions is second to none. If you are looking at a novel way of having a fundraiser: 1. Run with “The Pull” as your fundraiser but 2. Try to learn from the lessons of Ballybore GAA. Well done to all concerned.’ – James Deane, PRO, Shannon Gaels GAA Club, Co. Rosconmmon. ‘Thanks to everyone in HalfSolid Productions for a great night’s entertainment with “The Pull” here in Caherlistrane GAA Club. You put on a high-energy show with a mix of seriousness and comedy that had even the smallest of details covered. In particular, anyone who has ever had a role in their local GAA club could relate to the characters you portrayed to a tee, whilst those who haven’t now know what goes on!. This was a unique evening for the club to host and doubled up as a very beneficial fundraiser. Best of luck with the rest of the run and you are welcome back to Caherlistrane any time.’ – Brendan Marrinan, PRO, Caherlistrane GAA Club, Co. Galway. ‘We had a big turnout for “The Pull” in Knockaderry – and everyone really enjoyed it. If you’ve ever been to a GAA meeting, you’ll enjoy it: and, even if you haven’t, you will still recognise the characters from your local community. John and Liam brought us on a very entertaining journey without us ever leaving our seats (well, most of us anyway!) See this show if you can.’ – Mike McMahon, Knockaderry GAA Bord na nOg, Co. Limerick. ‘What a night! “The Pull” was a great fund-raiser for our club on December 28th, 2012. People from a wide radius attended the show. As it featured one of our own (Liam Horan is a member of our club and our current secretary) there was great local interest – particularly as the original Pull was a truck pull we did in summer 2011 as a club fund-raiser. A great night, good for club funds, and a fun night out for club members too.’ – Alan Flannery, chairman, Ballinrobe GAA Club, Co. Mayo. ‘We found the “The Pull” to be a wonderful fundraising option for our club. It was a very enjoyable night and suitable for all the family.’ – John Roddy, Kilmovee Shamrocks GAA Club, Co Mayo. This show is not touring at the moment. For enquiries about how to get unique comedy brought to your venue, please call Áine on +353 87 382 2949 or fill in our contact form. Thank you.